Last week I decided to spend some time looking at the work of Michael Bogin at the Davis Gallery here on my school campus. After wandering the rooms of the gallery, scanning the walls in search of one of Bogin’s pieces that speaks to me, I notice a pattern. While at first seeming overtly simplistic, upon closer inspection his pieces start to formulate individual stories. Scanning the room, I am immediately struck by the stunning color schemes that run across the walls. 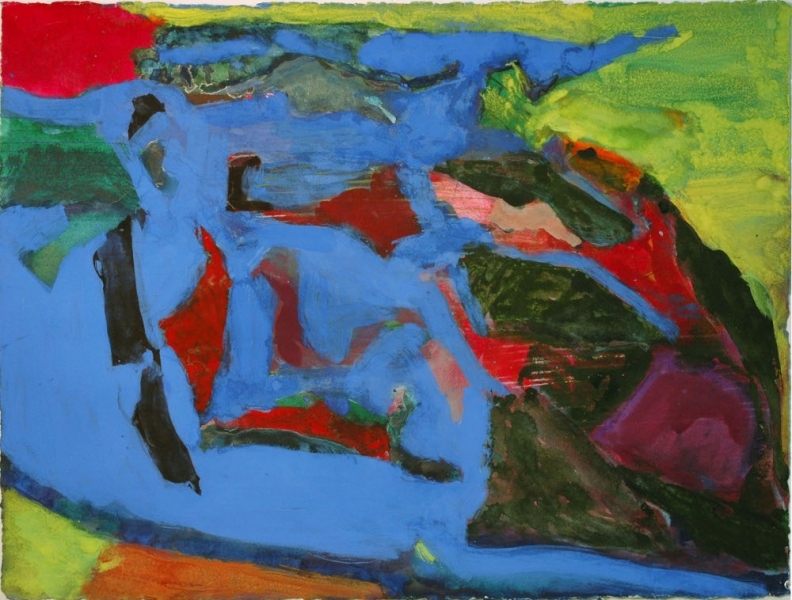 His use of color varies in each piece despite their overall similar structure and as the works progress, a tale forms. Upon closely looking at Galapagos #157, its shapes come to life and a story emerges. A koi fish whizzes past with a mermaid trailing behind; an underwater flower opens its blossom to say a few words; fish of every size decide to come investigate the scene; a coral reef arises from the abyss; bubbles float to the surface like fizz; and light begins to reflect off the ocean’s crystalline surface. As I continue looking, I realize that I have just reached the Ecuador archipelago. As I gaze into the depths of the Pacific, I see something dart by. With the face of a woman and the tail of a fish I deem her a mermaid. Here things get strange. I fall into a kind of dreamlike state and the creatures gain the gift of gab. The koi fish tells me of the mermaid’s high status amongst the sea creatures as the mermaid playfully chases him away. The coral reef begins to tell me of her tremendous beauty and suddenly the fish that reside in the reef come out to confirm her allure. The sudden commotion causes water bubbles to lift to the surface and as the bright reflection of the water hits my eyes, I snap out of my delusion and once again I am standing in the gallery. The process of slowly looking at Bogin’s painting proved a surprising experience. The more I look, the more I see. I now notice Bogin’s use of color and forms. The piece now opens up to me in a different way and I begin to see the intricacies of what Bogin has created. Done in gouache, watercolor, and colored pencil, the multi-medium quality gives the piece a depth that mimics that of the ocean. Looking at the center of the painting, it becomes difficult to tell if the water sits in the foreground or background. The sea creatures seem to remain in limbo undulating back and forth between the different layers of the painting and it is this confusion that leads to my intrigue. The more I look at the painting, the less sure I am of where all the shapes sit in space. The reds and oranges seem to float to the surface in some areas while they seem to recede into the cloudy blue expanse in other sections. After a while I begin to see the intentionality behind Bogin’s every mark. I can see, upon closer inspection, where he has laid down a block of color, taken most of it away, and then put down more paint in order to achieve the illusion of depth. The blues overlap the greens in the top portion and leave behind a shadow of what once was, thereby furthering the magic of his artifice. It is this ambiguity that endows the painting with such power. There seems to be an extreme intentionality that lies behind every mark in the painting. Simple shapes are transformed into sea life with Bogin’s poignant mark making and the scene comes alive with his innovative use of overlapping color. 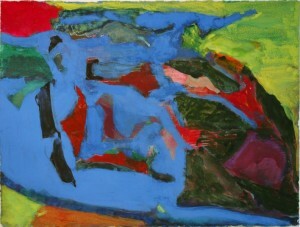 While there is a broad expanse of green and purple shapes conglomerated on the right side of the painting, this mass is offset with the smaller blocks of reds and greens that sit at the center of the scene. A large stretch of blue evolves into ocean in the areas where the watercolor pools into dark waves of indigo. Color merges and submerges in a playful coalition of paint and story. Just as your eye begins to follow a stream of red, you are pushed into a puddle of green; and just as you begin to circle around the green, your eye is slung into the neighboring pool of purple. This diversity of shape and color employed by Bogin is what gives the painting such life and allowed me to conjure up a story while exploring the piece’s nuances. Had I left the gallery after a brief browse, I would not have taken notice of the intention that lies within Bogin’s work. I would not have formed the connection to the painting that still remains. The practice of looking slowly at art requires no expert nor expertise; art speaks and I learned again that if I am willing to slow down and listen, then I will hear its story in all its dimensions.